Steinberg releases a significant update to its new professional scoring application, introducing advanced support for chord symbols, repeat endings, note spacing and much more. HAMBURG, Germany — June 28, 2017 — The future of scoring gets considerably brighter today with the release of Dorico 1.1, a significant update to Steinberg’s new professional music notation software. Dorico is the only scoring software that musicians can compose or arrange freely into: its deep knowledge of music theory ensures the music is always clearly and correctly notated, however complex it is and whatever changes are made to it. Dorico produces beautiful sheet music by default: designed by the most experienced notation software development team, Dorico is better at music engraving than almost any human. And Dorico is the only professional scoring program with an integrated piano roll MIDI editor and support for VST Expression. 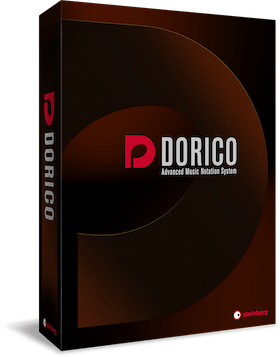 The new Dorico 1.1 update provides a significant step forward in the application’s capability, building on the nearly 500 improvements already delivered in three previous updates since its launch in October 2016. This release introduces sophisticated support for chord symbols. While chord symbols are added by playing a MIDI keyboard or typing on the computer, Dorico automatically writes chord symbols in any of six pre-set conventions, and lets users tweak the appearance using dozens of options. Dorico is also the only professional scorewriter to support polychords. • Expanded import and export features, allowing users to import music from other projects and MusicXML files into a current project, and export sections of a project in Dorico, MIDI, MusicXML and audio formats. For more information about Dorico, or to download the free 30-day trial version, visit www.steinberg.net/dorico. Dorico 1.1 is available immediately as a free update for existing Dorico users, and new customers buying Dorico for the first time will automatically receive Dorico 1.1 when they install. Dorico is available from local resellers or directly from the Steinberg Online Shop. The suggested retail price is €579 including German VAT. Students and teachers can purchase Dorico at the discounted suggested retail price of €349 including German VAT. For a limited time, users of Finale and Sibelius can buy a Dorico crossgrade at the special suggested retail price of €299 including German VAT, and a further educational discount is available for students and teachers, allowing them to buy Dorico for just €179 including German VAT. The crossgrade price is available until September 30, 2017. This entry was posted in notazione, notazione musicale, steinberg and tagged 1, dorico, dorico1, download. Bookmark the permalink.